Jeff graduated, with honors, from Colorado State University earning a degree in Business Administration with an emphasis in Finance. He spent 16 years in corporate America working for Accenture, Kwal Paint, Comex and the National Paint Alliance. 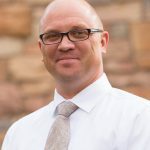 His titles have included Financial Analyst, District Manager, National Sales Director, Vice President of Sales and Marketing and Executive Director. As Managing Partner of the VR Mergers & Acquisitions office located in Denver, Colorado, Jeff is dedicated to taking an honest approach and giving you unparalleled customer service.